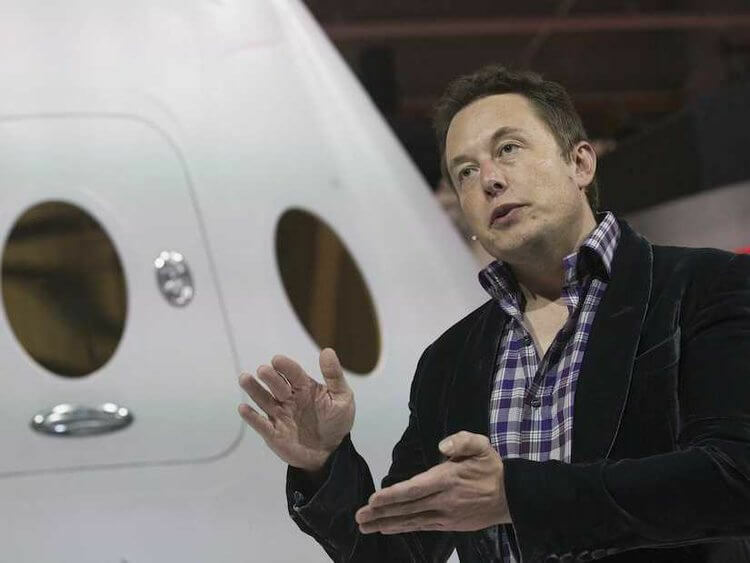 Elon Musk: Entrepreneur, Inventor… and Amazon Seller? Good business ideas aren’t super rare. After all, we’ve probably all come up with something that we think there’d be a market for. Maybe you’ve invented a kitchen knife with two handles. Or you created a card game that’s like Apples to Apples with dirty jokes. But how often does an entrepreneur put an actual car into space to draw attention to their brands? If you haven’t already heard, Tesla, in conjunction with SpaceX, put a Tesla Roadster into space with the launch of SpaceX’s new Falcon Super Heavy rocket. And that’s because Elon Musk, Tesla and SpaceX’s founder, is a mad man. And a genius. Edit: Elon Musk didn’t actually found Tesla, but is the CEO and one of its early investors. Thanks to the folks in the comments who so kindly pointed that out. To say that Elon Musk has good business ideas would be an understatement. The man has brilliant business ideas. World-changing ideas. And some of those, of course, are far above and beyond what the typical entrepreneur like you and I are capable of doing. The Tesla Roadster alone costs $200,000. And, oh yeah… the Falcon Heavy Rocket runs for about $90 million. But it’s Elon’s willingness to go big and bold that really sets him apart from most entrepreneurs. We don’t need multi-million dollar budgets to learn from that. In fact, we can take some of the broader ideas and learn a lot. 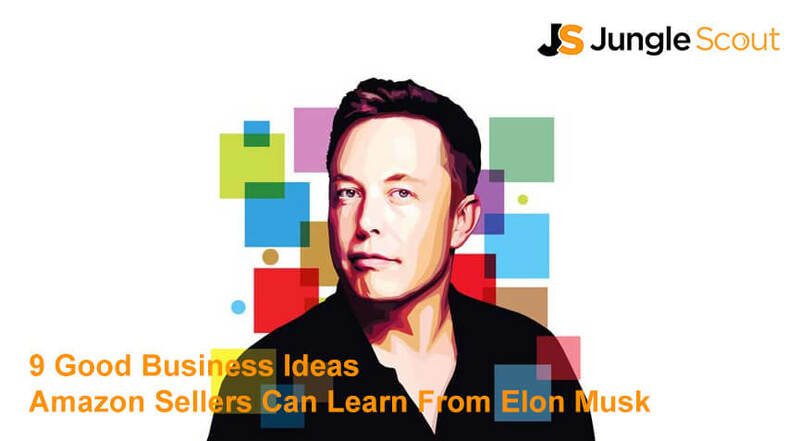 Here’s nine valuable lessons and good business ideas that we can learn from Elon Musk which we, as sellers, can apply to our Amazon businesses. Launching the Falcon Heavy rocket into space itself was an amazing achievement. 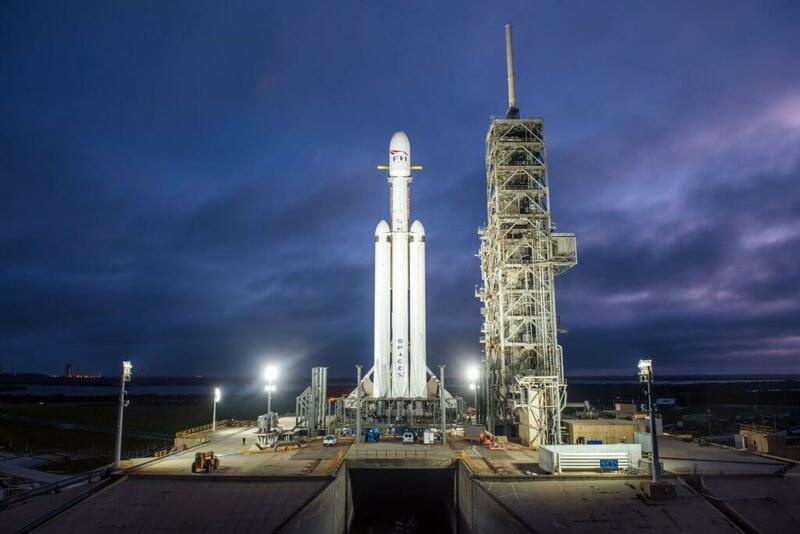 Beyond it’s million dollar price tag, the Falcon Heavy is the largest rockets ever created. That, in itself, is enough to attract people to SpaceX’s good business ideas. But what really made the launch unique, of course, was the car they put into space. And if that wasn’t enough, they surrounded it with cameras so we could watch it on its flight… er, drive… to space. That’s bold. Effectively utilize controversy to draw attention to your product–like Cards Against Humanity. Create some wild, non-typical images for your product listing (at least the non-main images). When sourcing, look at what your competitors are doing and try to stand out as much as possible on the search page–if everyone’s making a silver fidgetspinner, be the seller that creates the bright pink one, etc. Make a zany video that catches buyer attention while demonstrating the product’s features, like Squatty Potty did (see below). 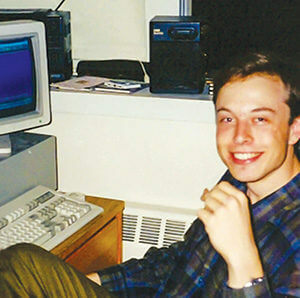 At Elon’s first company after college, Zip2, he took very little from the business. He was known to sleep at his desk. He drove a cheap car. It wasn’t about taking a big paycheck or “living the dream”, it was about building something. The same with your Amazon business. As you’re building your private label brand on Amazon, don’t think about taking a paycheck even when you have a great month. Instead, focus on what products you’ll get next, new ways you can market, and other methods to build. PayPal’s offer, still alive today. When PayPal, Elon’s second major company, was trying to build its customer base, they offered users $5 to sign up. Who’s going to say no to $5? Of course, this cost the company a ton of money, but in the end it worked out. Ebay later bought PayPal for $1.2 billion, cementing Elon Musk’s position as a brilliant entrepreneur. When launching a product on Amazon, it can be tough to cut in front of the thousands of other products and get in front of more people. The best way to do this is through instructing Amazon’s search algorithm that your product is worth notice by giving away promotions. Of course, just creating a promotion isn’t enough. You’ll need to advertise it, too. The fastest way to do that is by putting your Amazon product onto a promotional marketing platform like Jump Send. Previously, Kym wrote in the Genius Series that when it comes to product research and good business ideas, it’s better to sell a product that you love than one you’re doing just to make crazy profits. Elon’s companies have always been about changing the world. He’s working on what he loves and having a ball doing it. Electric cars with door handles that pop out when you get near them. Nobody asked for these things, or if they did, they could not have possibly imagined that the products would be as great as they were. These were more than just good business ideas. Henry Ford once said, “If I gave the customers what they wanted I would have just given them faster horses.” Elon Musk lives by the same philosophy. When creating great products to sell on Amazon, of course you will want to use Jungle Scout to find great niches and profitable product opportunities. But the real key to success on Amazon is through innovation and creating what’s never existed before. Whether you’re bundling products that make sense as a unit, changing the color, or just having fun with something that’s already there, get creative. They’re known as the PayPal Mafia. Peter Thiel, Reed Hoffman, Luke Nosek, Ken Howery, Steve Chen, Chad Hurley, Jawad Karim, Max Levchin, and of course, Elon Musk. All of these people built PayPal. And after PayPal, they all went on to do bigger and better things. Elon Musk, of course, started Tesla and Space X.
Peter Thiel built Palantir and was one of Facebook’s first equity partners. Max Levchin helped start Yelp. Steve Chen, Jawad Karim, and Chad Hurley started YouTube. Having a great team and great mentors (many of these people still assist Elon Musk today) is key to entrepreneurial success. This is something we know all too well with Jungle Scout. Many of us look up to Greg as our mentor, and even Greg has mentors of his own that he follows. There’s a great quote from Elon Musk that occasionally makes its rounds on social media. Now, that isn’t meant to scare people off. In fact, when Elon originally said it at the Founder’s Forum. he followed up with a “evil” laugh. And it’s true, being an entrepreneur is hard work. Yet, having a good sense of humor about the trials and tribulations you’ll face an entrepreneur–especially if you’re an Amazon seller, is simply a good business idea. Elon Musk wants to retire on Mars. Which is a pretty bold goal considering we’ve yet to even put a man or woman on Mars, let alone have the resources to allow someone to retire on it. But Elon is fully aware of this. Therefore, everything he does with SpaceX, Tesla, and all his other companies works towards that goal of retiring on a lifeless lump of red rock 54.6 million kilometers away. Sometimes it can seem like things are as far away as Mars. But it’s the little steps that matter. In one of my favorite books, Gary Keller and Jay Papasan’s The One Thing, Keller and Papasan encourage that we chase the big goals. Once we know where we’re going–whether it’s a 7-figure Amazon business or a retirement cottage at the edge of Valles Marineris–we can start working our way back from that goal. 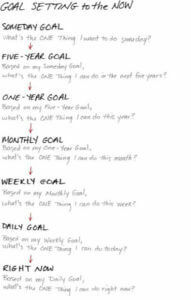 The One Thing’s goal setting strategy. It could put you on Mars! Working backwards from a “someday” goal. The process is simple. 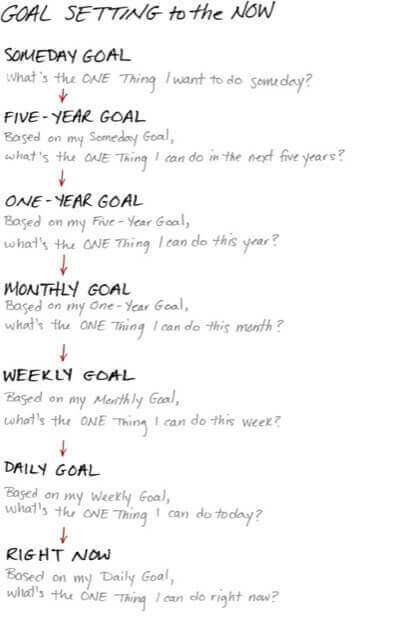 First, state your goal. Then, break it down into smaller bites. Okay, so what do you need to do in the next five years to reach that point? Okay, so what do you need to do in the next year to reach that point? Okay, so what do you need to do in the next month to reach that point? Okay, so what do you need do in the next week to reach that point? Okay, so what do you need to do today to reach that point? Okay, so what do you need to do RIGHT NOW? Did you know that Elon Musk taught himself rocket science. Literally. He taught himself ROCKET SCIENCE. And he did it through reading textbooks and speaking to industry heavyweights. Now, that’s not to say that we’ve all got to go out and memorize textbooks on rocket propulsion and astrodynamics. But it definitely pays to have a good mind for all the different elements that goes into operating a business. Those are good business ideas whether you’re building rockets for the government or selling fidget-spinners on Amazon. The Genius Series – A free guide to creating a profitable business on Amazon. How to Sell on Amazon FBA for Beginners in 2018 – Our very own Lenny Smith gives the basics of creating an Amazon business. The Jungle Scout Web App – Once you’ve got the basics of Amazon selling down, start checking out cool products on Amazon using the Jungle Scout Web App’s Niche Hunter. Elon Musk Has Good Business Ideas… But So Do You! Elon Musk is a Genius. We all know that. But so are you. And you don’t have to run a couple billion dollar companies to create good business ideas. Amazon selling and Jungle Scout are the perfect combination to express your creativity and develop a brand that’s all your own. If you’re new to the Amazon selling process, be sure to check out The Genius Series where we dig into actual steps to selling your own branded products on Amazon. It’s totally free and will offer nearly 500 pages of written content and 5+ hours of video content. Just click the button below to learn more. “Elon Musk, of course, started Tesla” is incorrect 🙂 I’ll eat my hat if that is correct so what are prepared to do? Ah, you’re right. I forgot that he came in later and kinda stole the thunder. Kinda the same story as Jack Dorsey (who’s not even CEO of Twitter, although everyone thinks he is). You guys are really a great company, a great team and agreat help! I am a JungleScount and JumpSend user, couldnt be happier with both! We couldn’t do it without folks like you, Walter! Great piece here! The One Thing transformed my way of thinking, not just from a business perspective but also in my personal pursuit of happiness.